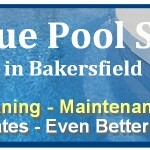 bakersfield pool tips Archives - Big Blue Pool Service - Best in Bakersfield!Big Blue Pool Service – Best in Bakersfield! 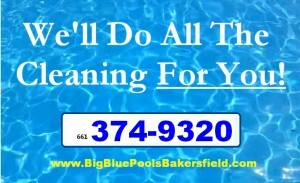 Big Blue Pool Service - Best in Bakersfield! 4. Advantages To Using a Pool Service! 6. Are You Ready To Relax In Your Pool? – Use a Pool Service in Bakersfield! Before you swim into your swimming pool, it’s important that you be sure that you’re pool’s filtration system is clean — at the center of the whole pool system is the swimming pool pump. Pool pumps are often gather bacteria and debri and that causes contaminants to build up in the pool. Keeping the pool filter clean assures that you will have a clean and perfect pool for you and your family. First, to clean the swimming pool pump filter at the house, you will need a garden hose before you begin. Then, you need to turn off the switch of the swimming pool pump by unplugging the pool pump. Next, look at the rim of the pool’s pump casing and remove it with a rubber mallet. Then the next step is to unscrew the pump cover and lining and check the ring around the top for cracks. If it has cracks, replace it. You can purchase replacements at any hardware or pool store. Now that you have unscrewed the pump cover, it is a good time to remove the swimming pool pump basket and look at the it’s shape. Is the basket circular? Use the necessary tool depending on the shape of the basket. 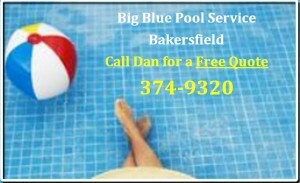 Of course, if this all sounds like a big hassle, simply call Dan at Big Blue Pools in Bakersfield for a free estimate. Dump the basket and wrap up this process by: washing it thoroughly with a hose. After you have finished this, you can then replace the swimming pool filter basket and put the cover back in reverse of how you removed it. You’ll tend to make good use of the rubber mallet. Lastly, switch on the power again and inspect your pump filter for any leaks. Pools are fun and a treat but maintain your filter and pump for maximal enjoyment or have Dan do it. Do you have a swimming pool in your home – Pools can bring many great many benefits, they are a blessing (and a curse at times if not kept up). Your swimming pool provides you exercise, recreation, leisure and socialization. The swimming pool can also add beauty to your backyard. However, the best benefit will come when you want to relax after a hot and tiring day. In those times, it seems as though you feel completely refreshed after a dip in a cool swimming pool on a hot day. But, if you don’t take suitable care of your swimming pool, you will be in for a challenging time through the summers. You have enough on your plate; why not consider the help of professional pool service: Big Blue Pool Service – Bakersfield to make sure which the pool is well cared for. Swimming pool maintenance can be costly – keep up a list of possible pool issues and stay ahead of the repairs where you can. Whether you have an in ground or above-ground swimming pool, with good maintenance you can stay ahead of expensive repairs. Regular maintenance can guarantee that your swimming pool remains at a maximum usable state throughout the season. Living in a hot area like Bakersfield, your pool will require to be maintained more often, especially the chemicals as the sun can quickly empty your pool of chlorine. The weather and the frequency of use are both important factors which determine the condition of your pool. 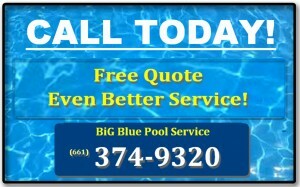 Professional services like Big Blue Pool Service Bakersfield can help you maintain the best pool chemistry. Quick tips to watch for: Pool chemistry which includes chlorine levels, and ph level. Those two areas go along way toward keeping your pool swimmable. The next issue is algae development in the pool. These organisms start as invisible to the eye and can gradually turn the your pool water yellow and murky. Check the pool visually every weekend and use ample chlorine to curb the growth of algae. If algae is not controlled, algae can result in damage to the swimming pool filters. If you find algae in the pool, either contact Big Blue Pool Service Bakersfield or use a recommended algaecide. Dan Phillips simply provides great pool service. He cleans, and goes the extra distance so that you as a pool owner have no hassles, or problems. And if an issue comes up – call him, he’ll take care of it. That includes pool repairs, general maintenance, storm cleaning, chlorine or other pool chemical issues, equipment issues and more. How can i speak so directly about Dan’s great pool service? Well, he cleans my pool and my pool is quite large and surrounded by many trees – it is a bit of a nightmare in the fall or when a storm hits. Yet, Dan is there and keeps it sparkling – he’ll do the same for you. Your Pool Can Look This Great!! – Pool Dan cares for in Bakersfield! Big Blue Pool Service takes immense pride in giving their customers friendly, caring service, with the customer’s pool needs and budgets in mind. 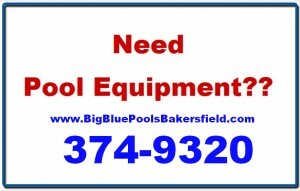 Big Blue Pool Service is a Swimming Pool Service and Maintenance Company, in Bakersfield, CA, that provides a host of pool services including weekly and bi-weekly swimming pool service plans, swimming pool chemical service, one-time swimming pool cleaning and inspections, chlorine service and more. Dan and his pool service staff also provide pool filter cartridge replacements, new pool start-up, pool vacation service, automatic pool cleaner parts and repair, pool equipment – pumps, pool filters, pool supplies, and pool plumbing services. Dan Phillips is a man that takes great pleasure in serving the pool owner in a respectful, kind and competent manner. This lends itself to better customer service and every customer can be confident that their “pool man” is someone who knows what he’s doing and how to do it with both great depth and the least possible cost to the customer. 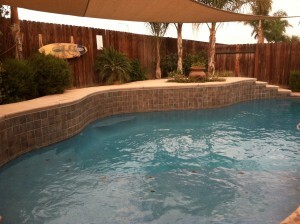 A Great Pool Service in Bakersfield – Enjoy Your Pool All Year! 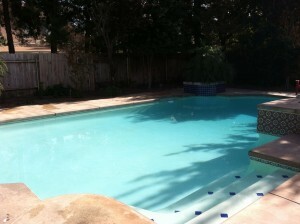 A Pool Service in Bakersfield That Will Do You Right! Recreation can be expensive. Have you priced a vacation at Disneyland? Are you considering taking a cruise? It’s not cheap to simply go to the beach and especially not an amusement park? We all undertand that it takes a few bucks to recreate and it’s worth it. What’s really great is to realize that your backyard swimming pool, can be s a mini-vacation all summer long. Do you have a pool service or are you doing it yourself? Swimming pool costs vary greatly, depending on the kind of pump installed, level of use and regular upkeep. Most pool owners who are energy conscious opt for reducing costs the easiest way possible: running the pump less often or not at all…bad idea. The pump does use electricity — it pumps water through a filter to keep the water clean. If the pump is not used often or at all, then when it is finally turned on it will end up costing you a great deal more in chemicals, the filter will need to be clean two to three times as much, not to mention you will be unable to use the pool because of algae problems. The best bet is to have a good quality filter that will make your pump work more efficiently in less time. There are three main types of filters: sand, cartridge, and diatomaceous earth. All have their pros and cons, but overall the diatomaceous earth variety is the most efficient and has the finer filtering of all three filters. But don’t discount the sand filter either. The cartridge type tend to work well but are harder to clean. Units typically fit both small and slow pool pumps, allowing for greater flexibility. Also, there are some brands designed to encase the actual filter fibres in cartridges, adding a whole new level of convenience for the pool owner. To reduce the annual costs of pool maintenance, take advantage of seasonal temperature changes. Since algae requires warm water, sunlight and carbon dioxide to grow, the warm months require regular use of the pool pump. In colder months algae does not grow, so there is not need to run the pump as often. As you begin to set up a regime of pool maintenance throughout the seasons, watch things carefully. Every region has different levels of humidity, temperature and water quality. Some places may see a faster development of algae, while others find it easier to keep the little goblins at bay. Either way, it is important to find that balance between energy savings and dirty water because everything boils down to cost. Having a pump with a 24-hour clock and timer on it will help reduce energy costs as well. The times for the pump to turn on and off can be set according to the season, providing the best year-round efficiency. Additionally, there is the option of a variable speed pump. These pumps include different speeds for water features and seasonal changes that require less water and electricity. In fact, the variable speed design reduces energy costs so significantly; California enacted a mandate in 2008 demanding the use of two speed pumps in every pool. Now there are pumps with up to eight programmable speeds. Having a backyard swimming pool doesn’t have to cost an arm and a leg. Regular maintenance, good quality equipment and the intelligent use of energy will reduce pool expenses a great deal. 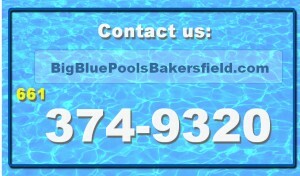 Partner with a swimming pool service who has staked their reputation on knowing about pools and caring for their customers – Big Blue Pool Service in Bakersfield, CA. 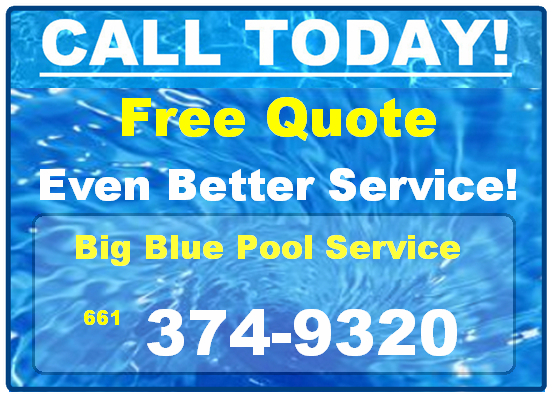 Big Blue Pool Service brings together the strongest team of swimming pool professionals. We enable our customers access to the highest quality of swimming pool equipment at the best prices available, without sacrificing service. For more information about pool pumps, filters, heaters and cleaners, visit us online or give us a call. Big Blue pool service will do everything possible to exceed your expectations — courtesy to you and great pool service care! Is Cleaning Your Pool a Hassle? A backyard pool is a no small responsibility. Ensuring the safety of your family and guests when they use the pool looms large as does maintaining the service needed on the pool. In some ways, they are the same issue. Proper pool service is a big part of your family and friends being able to enjoy the pool safely. Correct sanitation is needed to maintain the water clarity and to control and ideally stop algae build up. Proper pool care prevents possible illness from dirty or algae filled water and also deters the deterioration of pool equipment. A chemically unbalanced swimming pool can lead to skin and eye irritation as well as shorten the lifestyle of pumps and filters. Pool service when done by the home owner is not for the timid or faint of heart. 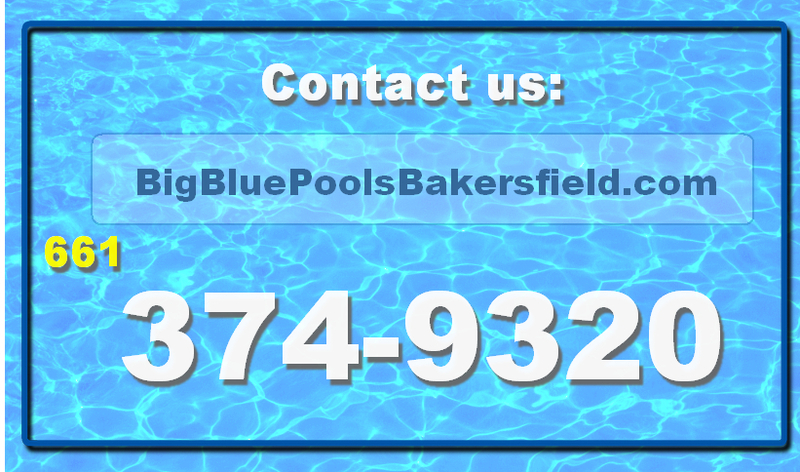 That may sound a bit self-serving, but at Big Blue Pool Service in Bakersfield we specialize in knowing every aspect pool service and maintenance and our goal is to enable you to simply enjoy the pool. 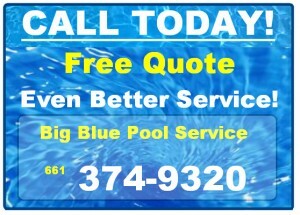 Allow Big Blue to eliminate the hassles of pool maintenance and repairs. Our pool staff will service your pool weekly, take care of all of the ongoing maintenance, maintain proper chemical balancing and do everything in our power to stops costly swimming pool repairs. We all have families that we want to provide for and enjoy and swimming pools play a part in that. We mentioned above the hassles of pool service and frankly pools are a big job at times which can become a big hassle when it’s not your main focus. In fact, when you come home from work and you know that you have maintenance to do on the pool – some of which you do not really understand, the hassle becomes a dread. Again, that is where a pool service steps in. We know pools, and it’s not a hassle for us, it’s what we do. Get to know us; allow us to remove the hassle and dread – we are a pool service business with a heart to serve. Sorry, but Pool Cleaning is part of owning a pool! Having your own backyard pool creates multiple opportunities for fun, socializing and deepening friendships. At the same time, it takes a good amount of effort to keep that pool looking great and not create hassles. If you’re a “nurturing” kind of person with a good amount of available time, you might find the process of cleaning a pool each week rather enjoyable, yes even a bit “nurturing”. But catch the emphasis on the word “time”. It will take your time. If you plan to clean your own pool, buying top quality products is important. The old adage that “you get what you pay for” is pretty accurate here. 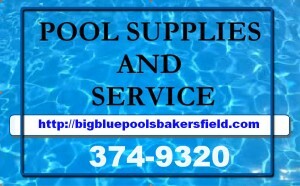 Big Blue Pool Service Bakersfield can do your pool service for you or sell you the quality pool service products you may need. Know the measurements and gallons of water that your pool holds. These will be used to maintain the proper chemicals in the pool – too much is NOT a good thing when it comes to chlorine and ph levels. The various steps of pool service includes: checking the chlorine and ph levels, brushing the walls and floor, vacuuming the bottom, skimming any debris off the top of the pool such as leaves, emptying both the skimmer baskets and the pump basket. You will do the majority of these items weekly, but on occasion, you will want to check the baskets and empty them as well as keeping the water level high enough so that the pump doesn’t run dry. BigBlue Pool Service in Bakersfield offers you these 5 Pool Tips! Do you use a pool service in Bakersfield and Kern County to clean your pool or are you likely to service the pool yourself? Either way, keeping your pool clean is no small endeavor. Most days it does not require a “rocket surgery” intellect :-), but there are days when you may wish you had those “smarts”. The first thing you’ll need to do is get a good maintenance plan and use the right products. These 5 great tips on proper pool care and maintenance will give you a basic understanding of how your pool functions. Follow these for a carefree, relaxing swimming season. These pool tips are designed to be preventive pool service maintenance for your backyard or commercial swimming pool. The 5 steps are simple, but are often not followed as closely as they need to be in order to maintain a “happy pool” and to keep your happy attitude. The pool steps are: pools must be circulated, filtered, cleaned, tested and filled with the appropriate chemicals. Pool service includes the water being circulated for maximum sanitizing and filtering of contaminants. Many professional pool service companies advise that circulating water during the day is best and generally for 8-10 hours if possible. This circulation process keeps your pool water in motion and makes it more difficult for bacteria and algae to take hold. The circulation also captures debris through the skimmers and filter. 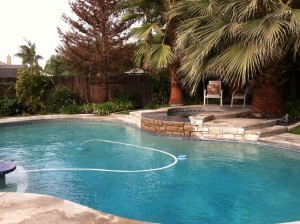 DIY or professional pool service in Bakersfield requires a good filter. The filter is one of your most essential pieces of equipment and you have at least 3 good options. 1). Cartridge style filters. 2). Sand filters 3). DE (diatomaceous earth). Each has different price points, convenience factors and filtering capabilities. Your filter removes both visible debris and most microscopic matter. Generally, a filter should be backwashed (the removal of material trapped on or in the filter media) when the water pressure in the filter reaches 8 to 10 psi above normal. (Check manufacturer’s guidelines.) Because backwashing does not remove oils and deeply embedded debris, check with a pool service pro to determine if your style of filter needs to be chemically cleaned regularly. Cleaning is what usually comes to mind when you think of pool service. As stated above, circulating your pool and maintaining a good filtering system is essential and those go hand I n hand with manual cleaning and chemicals (below). The combination is what keeps algae and bacteria at bay. At least once a week, the walls and floor should be brushed and vacuumed to remove debris that the filter misses. Brushing is a must and stirs up the debris and algae and allows the vacuum and the filtering process to work more efficiently. Do this even if you use an automatic pool cleaner. Pool service fine points may vary from pool to pool because swimming pools are unique. Important details to maintain include the pH and the level of active sanitizer (typically chlorine). By testing these two details at regular intervals, you’ll understand how the varying interval and load of swimmers in the pools, weather and product application affect the water. Test your pool water two or three times per week. Also, take a sample to your local pool store when you open and close your pool, and every four to six weeks during the season. This will help you maintain proper water balance and greatly reduce the potential for problems. Provide a sanitary swimming environment. Balance the water to protect the equipment and pool surfaces. Unbalanced water can permanently damage both. The goal with maintaining a disciplined pool service is to provide brilliant, sparkling water that’s inviting for family, friends and guests. – These pool services can be maintained by you as the pool owner or outsourced to a professional pool service company for cleaning. Contact BigBluePool Service. We’ll be glad to provide you with a free quote. 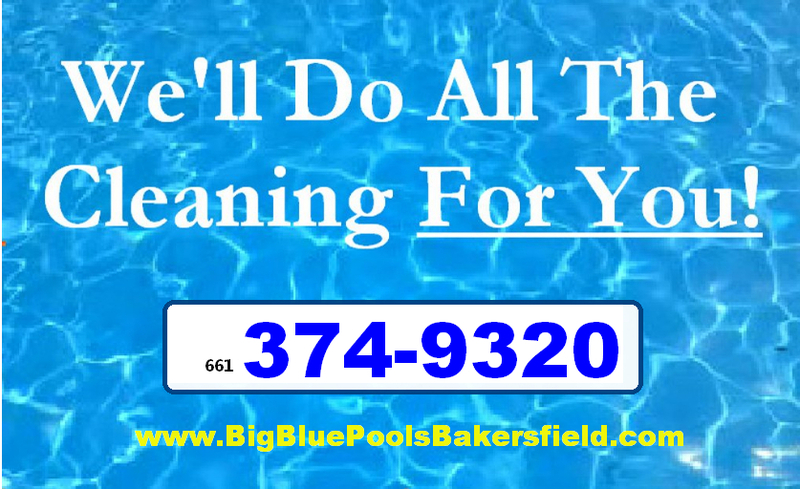 Big Blue Pool Service – Best in Bakersfield! It is quite common that the people possessing a swimming pool are sure to make use of the swimming pool chemicals for many reasons like maintaining the quality of water or to maintain the level of algae in pool. It's nice to have a swimming pool in the home but have to take full responsibility of proper pool maintenance to make sure clean and safe water. If you’ve been wondering how to clean pool.